One Post Office Square is a 40-floor Modern skyscraper in the Financial District section of Boston, Massachusetts. 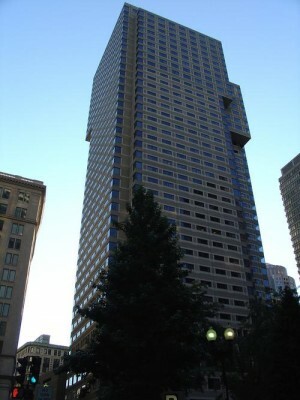 The skyscraper is Boston's 10th-tallest building, standing 525 feet (160 m) tall. The building has approximately 766,000 square feet (71,000 m) of Class A office space. An attached, eight-level parking garage offers 368 parking spaces and direct access to the building's lobby. It over looks Post Office Square Park It was designed by Jung Brannen Associates. The exterior is modern style sculpted tower that consists of a steel frame with a concrete aggregate facade. The three-story lobby is finished in patterned Rosso Verona and travertine marble walls and floors accented with mirror bronze signage, hand rails, and window bands. HVAC is controlled by an automated, Energy Management System for maximum comfort and efficiency. The building is connected to the Le Meridien Hotel at ground level by a private passageway. Skyscrapers by Pietro Belluschi, Inc.